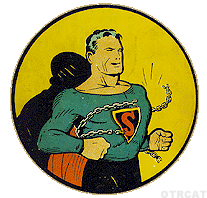 August 31, 1946: Superman' back to the airs on MBS. Superman had been dropped from the program schedule earlier in the year, but the outrage of youngsters brought the show back to the airwaves. "Look! Up in the sky! It's a bird! It's a plane! It's Superman!" Able to leap tall buildings in a single bound ...the caped crusader returned to radio on the Mutual Broadcasting System. The amazing power of Kryptonite in the hands of kids! Bud Collyer, later of TV's Beat the Clock, played Clark Kent aka Superman on the series. Most people didn't have a clue as to the identity of Superman until a TIME magazine article about Collyer appeared in 1946. His identity had been well guarded for years.